It is possible to do these three attractions in a single day providing you set out early and plan your day. Cueva de los Verdes, Canary Islands, Spain. Reflection on water. As we live in Playa Blanca, we travelled north on the LZ-2 via San Bartholme and Teguise into the mountains in the north where we made our first stop at the Mirador Del Rio. This is a cafeteria cut into the mountains in the north and has the most spectacular views of the island you could possible want to see, so a camera is a must. After a drink and a snack, we continued North and then turned at the top of the island and made our descent to sea level, where we saw an array of different coloured sands blown across the sea from the Sahara desert. If you are into beaches, you might want to stop off here to explore the many bays on offer. Shortly after this we arrived at our second attraction, the Jameos del Agua. Enchanting, Mystical & Magical, the three most common words used to describe a place created as a result of a formation of gas explosions within a volcanic bubble. Over the years, seawater has flooded the tunnels so that eventually a lagoon has been left behind. A lagoon that is home to thousands of tiny white crabs that have become blind through many years of living in poor light, a lagoon that has a bar and a restaurant and even a nightclub three times a week ! Mirador Del Rio on Lanzarote. La Graciosa can be seen in the background. Almost next door, we found our second attraction of the day - La Cueva de los Verdes, one of the longest volcanic galleries in the world at 6km long and there is surprise element to this tour which I cannot tell you about otherwise it would spoil your visit. You need to be reasonably fit and healthy as you need to climb several stairs and bend over in order to get under many low recesses. It is impossible to take a pushchair into the caves, so go prepared. We had an hour to kill at the end of the day, so we stopped off at the Jardin de Cactus which is on the way back. Here we saw 1,400 different species all planted together in a small area of land to create the beautiful Cactus Garden. A great day out and the children really enjoyed it and they slept like logs that night ! It is located on the eastern side of the Canary Islands and is a mere 13 miles wide and 40 miles long, so you can travel to each and every part of the island and spend the whole day not having to worry about lengthy journeys to and from excursions and one of the most appealing aspects is the climate as it offers warm temperatures and scarce rains all year around, turning it into a great place for those who wish to spend time at the beach and enjoy as many outdoor activities as possible. Boat Cruises, Catamaran, Fishing, Submarine or perhaps you just want to go to an aquapark. If you prefer the more cultural aspects of a location, then you have to come to 'heaven'. This side of Lanzarote is best summed by the mere mention of one mans name - Cesar Manrique, a man whose influence can be seen all over the island at places like Castillo de San Jose, Ceuva de los Verdes, Fundacion Manrique, Jameous Del Aqua, Jardin De Cactus, Mirador Del Rio, Museo Campesino and the fantasic Timanfaya ("Fire Mountain") and in future articles I will write about each of these. Lanzarote is the only place in the world where you have your lunch in a cafeteria that is built on top of an active volcano, where the heat to cook your food comes from the volcano itself ? and where else can you go deep into a cavern in the middle of nowhere and find a huge ampitheatre used for live concerts, aplace that doubles as a nightclub two evening a week ? If you want a great beach, then again Lanzarote has one to compare with the very best. The Montañas del Fuego (Fire Mountains), to give them there proper name were created in the 1730’s when more than 100 volcanos in what is now the National Park, rose up to devastate the southern part of the island. Eruptions lasted for six years and several villages were completely destroyed. The last eruption on the island was in 1824. 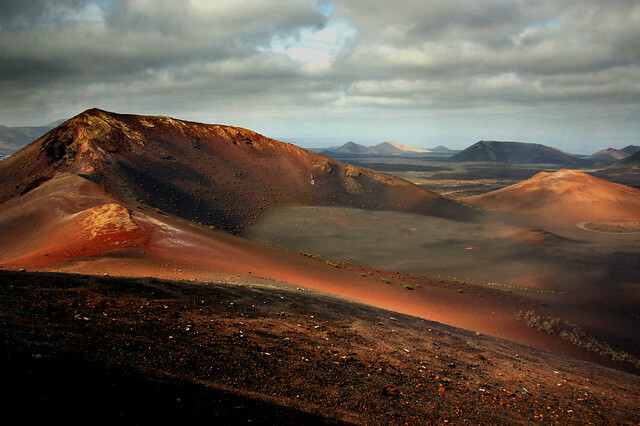 Because Lanzarote has such low rainfall (and therefore a lack of erosion) the area appears much as it did at the time and in 1968 the area was declared a national park “Parque Nacional de Timanfaya”. We decided to make a full day of this trip and we firmly believe that this a must see for any visitor to the island, because of its unique 'martian' landscape and rare plant species. On entry to the national park (entrance was around 8 euros per person, as I recall, and the small children were free as is usual at many of the islands attractions), the first thing to catch our eye were camels and of course we had to stop because the children wanted a ride ! An hour or so later, we arrived at the Car park of the Islote de Hilario, where we saw a crowd of people standing around a hole. This was to be the first of two quite stunning demonstrations of just how hot the area is just below the ground. We were told that temperatures a few metres below ground are a staggering 400°C to 600°C. Dry bushes were thrown into a hole and in less than a minute, it caught fire ! Water was then poured into a bore hole and seconds later the water erupted back into the air as steam and we all got a warm shower because we were standing on the wrong side. Next up was the 'El Diablo' restaurant, another creation of the famous artist (Cesar Manrique), whose influence is everywhere on the island. Here we find traditional Canarian food cooked using geothermal heat (A cast-iron grill placed over a large hole in the ground). Where else in the world can you get your food cooked on a volcano ! We then went on a coach trip of the National Park (part of the entrance fee). If your feeling a little queasy or don’t like heights don’t sit by the window as it can be quite scary (but very safe and the children absolutely loved it). The coach stops at several strategic points in order that you can get some amazing pictures and film (so don’t forget to take the camera/video with you). During the trip we listened to recorded narration based on words captured by the priest of Yaiza at the time of the eruptions. Another great day and another great attraction.